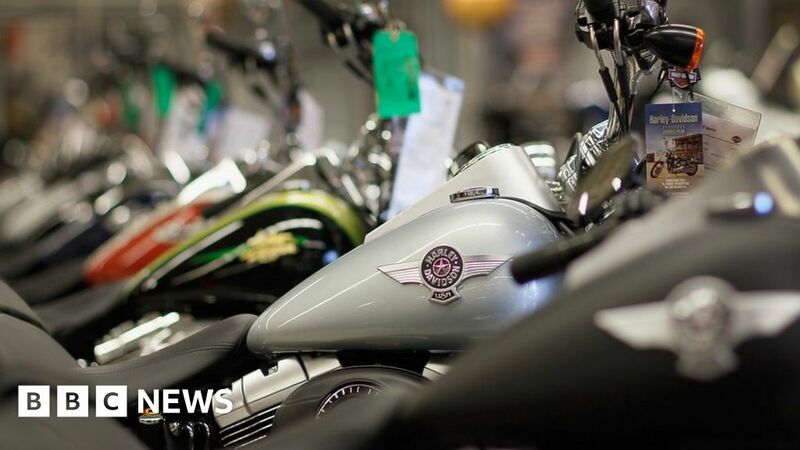 Motorbikes, whiskey and T-shirts are among the US goods that could be hit by EU taxes if the US imposes import tariffs on steel and aluminium. The EU has drawn up a target list of 100 US goods worth €2.8bn ($3.5bn, £2.5bn), the BBC understands. The list, which also includes cosmetics, agricultural and industrial goods, was circulated to the 28 EU member governments on Monday. EU commissioners are expected to discuss the proposals on Wednesday. Many of the products the EU has in its sights are specifically chosen to have maximum political effect. Bourbon whiskey is produced in Kentucky, the state of Senate majority leader Mitch McConnell. Orange juice is a key export for Florida, a swing state in the US elections. What is the EU considering? She said that if the US went ahead and applied taxes to European steel, the EU would take the issue to the World Trade Organization (WTO). 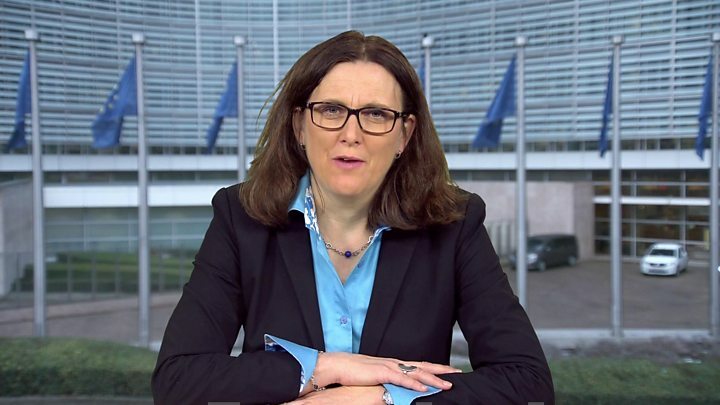 Ms Malmström stressed that Europe was looking to respond “to retaliate but not escalate”. What does Trump want to do and why? Mr Trump has decried the “$800 Billion Dollar Yearly Trade Deficit because of our ‘very stupid’ trade deals and policies”, and vowed to end it. On Thursday, he said steel imports would face a 25% tariff and aluminium 10%. Then came Saturday’s threat on EU-made cars. In January, he had already announced tariffs on solar panels and washing machines. What are US’s trading partners making of this? Zhang Yesui, spokesperson for China’s National People’s Congress, said it was natural that “some friction will exist” between the US and China, given the volume of trade between them surpassed $580bn (£420bn) last year. But he said China would take “necessary measures” if its interests were hurt. Canada said tariffs would cause disruption on both sides of the border. Prime Minister Justin Trudeau said he was “confident we’re going to continue to be able to defend Canadian industry”. Brazil, Mexico and Japan, that have said they will consider retaliatory steps if the president presses ahead with his plan. Has Trump got political support at home for a trade war? A number of Republicans have questioned the wisdom of the tariff proposal and have been urging the president to reconsider. US Speaker of the House Paul Ryan has said he is “extremely worried” about the impact of a trade war, adding that it could undermine economic gains. Senator Orrin Hatch said American citizens would be made to pay, while Senator Ben Sasse agreed that “kooky 18th Century protectionism will jack up prices on American families”. Jason Furman, former chairman of the Council of Economic Advisers under President Obama, told the BBC the proposed tariffs were “a very costly and inefficient way to help a small number of people”. “This could be bad or awful, there’s no scenario under which it’s good,” he added. But steelworkers in Pennsylvania and Indiana will welcome Mr Trump’s comments. President Trump hinted on Monday that if the US achieved a better deal for itself in the latest North American Free Trade Agreement (Nafta) he would abandon plans for a tariff on Canada’s and Mexico’s steel imports. The rest of the tweet is a reference to Canada and US farmers. Substantial changes to the Nafta agreement are not likely to happen soon, however. The current round of Nafta talks, about updating the 24-year-old treaty, finished on Monday with little progress. Is Trump right about the trade imbalance? Since 2000, the US steel industry has suffered, with production dropping and the number of employees in steel work falling. The US is the largest export market for EU cars – making up 25% of the €192bn (£171bn; $237bn) worth of motor vehicles the bloc exported in 2016 (China was second with 16%).